Concrete is pretty amazing stuff. It can be poured, shaped and made into just about anything you like. But even though it's incredibly strong, it's not indestructible. So, when you see cracked concrete or a driveway or patio that has sunken or broken slabs, there are reasons why these things happen. The good news is with the right materials, equipment, and help from the experienced professionals at Total Foundation Solutions, concrete damage can be repaired. Call us today at 814-208-9442 or click below to get a free concrete repair estimate in Edinboro, Erie, Warren and the nearby areas. Whatever the cause of your concrete problem, we have an effective solution. 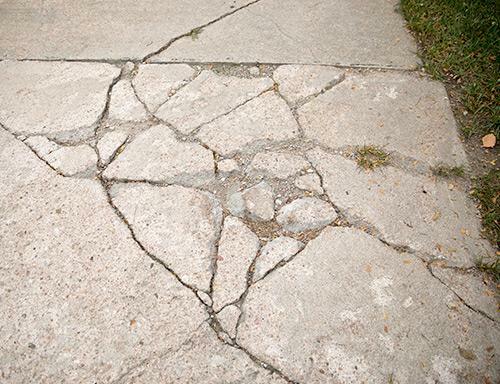 Total Foundation Solutions offers concrete repair for settlement, sinking, and cracks. We will assess your property and recommend the best solution for your driveway, patio, or any concrete slab that needs repair. Call us today at 814-208-9442 or contact us online for a free estimate in Edinboro, Erie, Warren, Meadville, Fredonia, Jamestown, Olean, Du Bois, Harborcreek, Hermitage and the nearby areas.